Delhi is a wondrous cacophony of noise, wandering livestock and chaotic traffic. However, the city also offers beautiful sights and a sensory experience unlike anywhere else in the world. 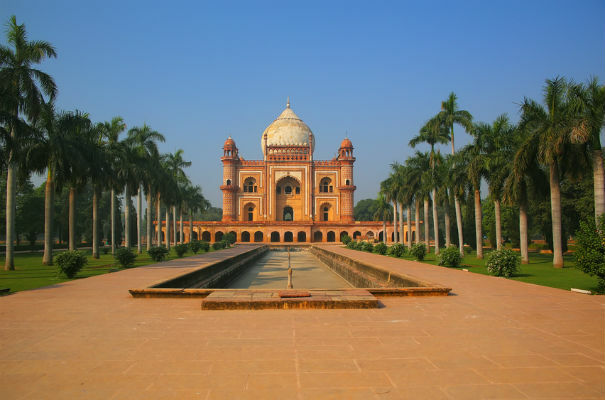 There are tombs, monuments and mosques at just about every turn, along with grand, colonial architecture, great museums, gardens, as well as the UNESCO-listed Red Fort Complex and, of course, the incredible Taj Mahal. When you’re not seeing the sights, there’s an abundance of markets, bazaars and shops for you to explore as you search for that ideal memento to take back home. The municipal centre is noted for being well-planned and home to some of the city’s key attractions: the Presidential Residence and India Gate, the national monument of India, for example. Meanwhile, Old Delhi bustles with crowds, rickshaws, cars and animals weaving through its crumbled walls and narrow streets. If you tire of walking, Delhi’s metro, the DMRC, provides a quick, cheap and efficient way to get around the city. Solo travellers can choose to enjoy some company during their time in the city. You might like to join one of Delhi’s meet up groups and share your experiences with like-minded people. When it comes to eating in Delhi, street food is the culinary heart of the city – head to the spectacular Chandni Chowk market and enjoy the Chaat. When you’re ready for a break from all the commotion, an escape to the mountains should prove relaxing, provided you don’t overdo it taking to all the mountain trails. There are several hill stations near Delhi to choose from, ideal for enjoying the enchantment of the Himalayan ranges, deep gorges and snow-capped peaks. Goa boasts a fascinating history and you will find that wherever you go, legends are often revived. Even the waterfalls are complete with tales of Indian princesses and their suitors. Meanwhile, the colours, scents and tastes of Goa leave lasting impressions. The combination of past Portuguese influences and a strict Hindu culture make Goa the unique place it is. The UNESCO-listed churches and convents of Goa – the Basilica of Bom Jesus and The Shata Durga Temple – are prime examples of magnificent architecture which reflects the diversity of the city. Getting around normally requires the use of private buses and auto-rickshaws, an experience in themselves and when it comes to food, a Goan dish is often seen as incomplete unless it features fish. For a break from the busy metropolis, Goa’s 105 kilometres of stunning coastline hosts world-class beaches, particularly popular with overseas tourists and travellers. To a great extent, they attract a laidback crowd and the 1960s hippy legacy lives on in places like Arambol in the far north. A visit to Goa can’t be complete without taking in its natural beauty. The area’s many rugged yet scenic spots make for exciting mountain trekking with trails leading to some stunning and unforgettable alpine views. It’s a good idea to take a guided tour from the city or book it as part of your holiday. That way, you’ll get to see spectacular places that often only the locals know about. Some favourite trails follow the series of picturesque hills making up the Vagheri Peaks, near Chorla Ghat.